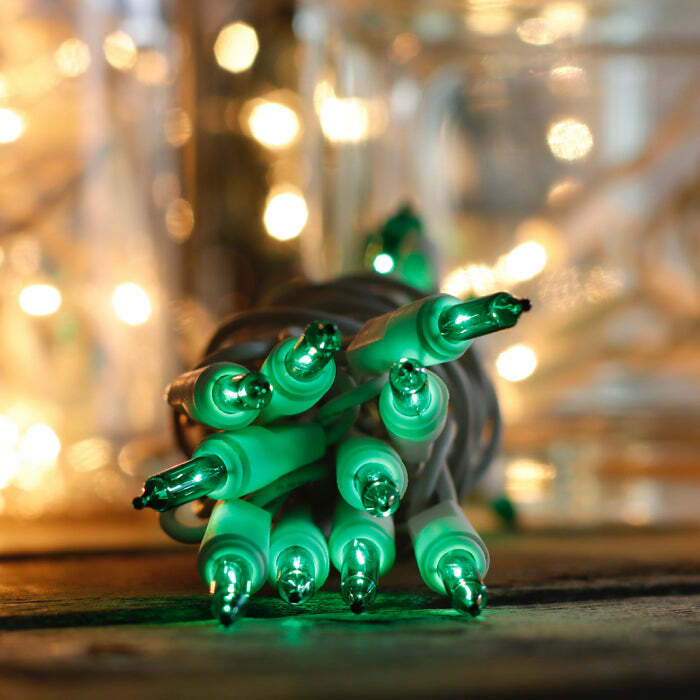 Our favorite way to use these green mini lights is lighting up glass containers. One plug, 20 bulbs and a 3-ft. lead wire make them ideal for small crafts and projects. If you are putting them in wine bottles or vases we recommend the white wire for blending in better with clear or frosted containers. Be aware that incandescent bulbs do have a heat output so it's best to monitor the containers and not leave them plugged in for extremely long lengths of time. We wouldn't want to damage Aunt Hetty's cherry wood armoire. Each string of green mini lights is almost 5 feet in length. This is ideal to add a little bit of sparkle to your mantle, wrapped around natural or artificial greenery. Even a small wreath or topiary can have extra sizzle with these craft lights. Consider using these green craft lights in lanterns for an extra bit of luck when you celebrate on St. Paddy's Day! As a hobby I make nightlights out of wine and liquor bottles. This was the first time I purchased lights from Christmas light source. They were prompt in shipping my product and I received it in a timely manner. I was surprised to find these were not the cheap lights that you find in a cellophane bag, but higher-quality lights along with instructions on how to prolong the life of the lights. This will be very helpful to those who purchase my nightlight bottles. I will be purchasing more lights from this vendor without worry. Items arrived promptly and were as described.